It’s like a scorecard following golf rules—the lower the score the better. Except this score packs a much bigger punch because your performance affects the well being of the entire planet! Never mind stressing over the results of your first chemistry test, this one score should be the grade you fear most! I’ll give you a hint in case you haven’t figured it out. I’m talking about a carbon footprint. 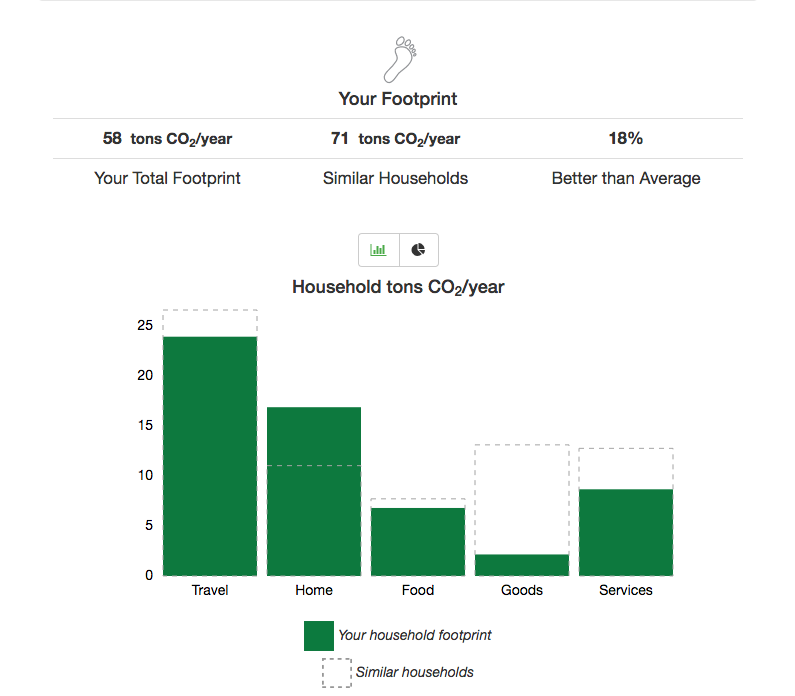 Your carbon footprint score is a direct measurement of how you as a person are impacting the environment. Do you drive a vehicle that gets less than 20 mpg? Are you a frequent flyer racking up lots of air miles? Is Styrofoam sitting in your trashcan awaiting its fate in the landfill? If so, you may not be happy with your grade. 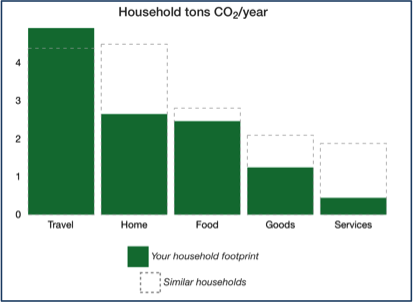 While my footprint of 12 tons of CO2/year is 25% better than the average one-person household, it does reflect a lot of carbon emissions. 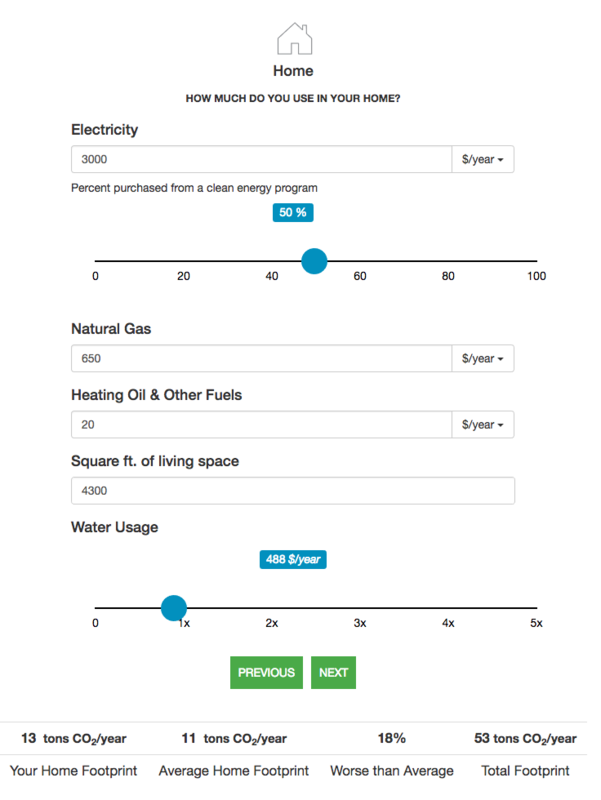 I thought my score would be better since I don’t own a car or have a house to maintain, so my services and home categories are low. This made me realize that even a person who considers herself to be living a sustainable life should evaluate what her carbon footprint is. It is great if you turn off the lights when you leave the room or shut the faucet while you brush your teeth, but the energy saved from these actions might not be enough to compensate for your other daily actions that are unsustainable. It is important to look at the whole picture. Time to face my score! 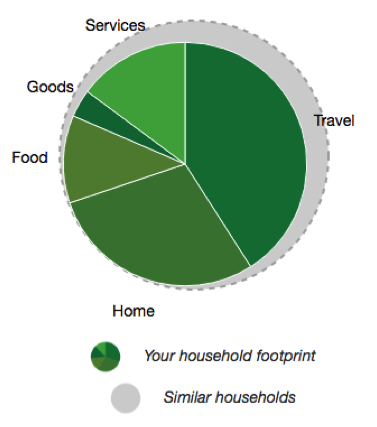 You can see how my footprint compared to similar households in the following graphs. As I expected, my travel score was the worst segment of my total, with nearly half of my yearly emissions coming from travel alone! I don’t have my own car on campus and I walk to and from classes, but some of my extracurricular activities are off-campus so I rely on transportation. Also, since I attend an out-of-state college, a large part of my travel emissions comes from flights to and from home. Unfortunately, the travel segment is the hardest for me to change. 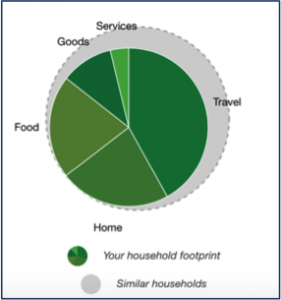 While reducing my travel could create a dent in my carbon footprint, it would be a large demand to place on me, and difficult since I already keep travel to a minimum. Instead, I will work toward reducing one of the other large contributors to my carbon footprint. This “test” has really opened my eyes to how large of a carbon output is caused by food production. I did a lot of work last year with pollinators, so I try to buy organic produce whenever possible to prevent the spread of dangerous pesticides. 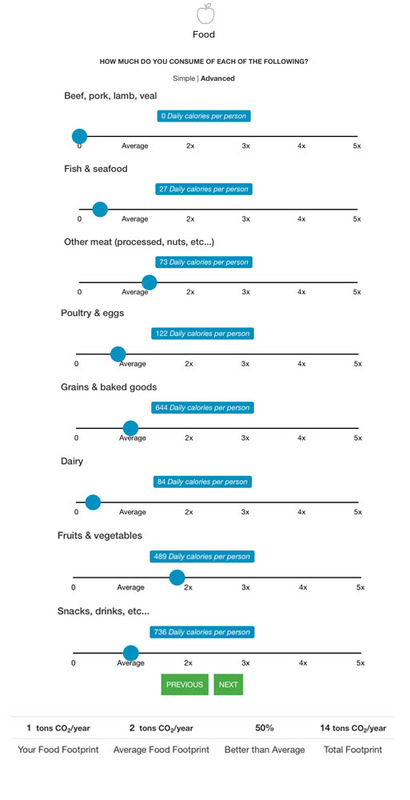 It never occurred to me how significantly my other food choices impact the environment, just in a different way. According to a recent study in Nature, agriculture contributes to 1/3 of the world’s total carbon emissions. It’s not easy but I am going to challenge myself to reduce my carbon footprint by changing the food choices I make. Rather than grabbing beef tacos at the DUC I will eat more vegetable-based proteins and proteins that don’t generate methane, for example, chicken. 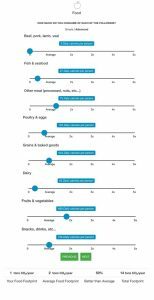 In addition, I will limit the amount of processed foods I eat and select less processed items, such as brown rice over the traditional white rice. Don’t know your footprint? 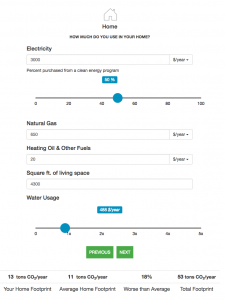 Take the test at: http://www.nature.org/greenliving/carboncalculator/ it’s not an easy “A”.